Many Americans only know chestnuts from the famous line, "chestnuts roasting on an open fire," in the 1945 song, "Merry Christmas to You," by Bob Wells and Mel Tormé. Prior to its demise in the first half of the 20th century, the American chestnut (Castanea dentata) was one of the largest and most important timber- and nut-producing trees in the eastern United States. In less than a lifetime, the native American chestnut population that spanned the entire Appalachian Mountain range plunged from an estimated 3-4 billion trees to a few hundred survivors. This was all due to the introduction of an exotic Asian bark fungus (Cryphonectria parasitica) growing on the bark of resistant Chinese (C. mollissima) and Japanese (C. crenata) chestnut trees imported by the New York Zoological Park (now known as the Bronx Zoo) for addition to their collection in 1904. "All types of 'true' chestnuts are edible raw or roasted, though roasting is the preferred method, not only for enhanced flavor, but also for ease of peeling the brown skin-like pellicle from the yellowish-white edible kernel of the nut," says University of Illinois Extension educator Elizabeth Wahle. Although American chestnuts are considered one of the sweetest tasting chestnuts, its nickel-sized nut is relatively small compared to others. European "sweet" chestnuts (C. sativa) and Chinese chestnuts that now dominate the American market are not considered quite as sweet as the American chestnut, but their larger nut size makes up for this difference. In addition, chestnuts in the genus Castanea interbreed readily, which opens the door for breeding hybrid cultivars with blight resistance and superior nut quality. But what about those other chestnuts? 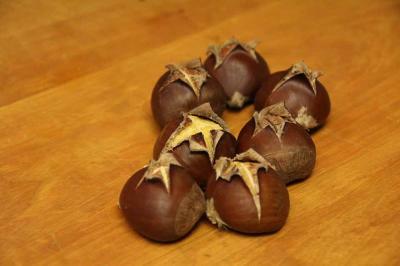 "Horse-chestnuts or buckeyes (Aesculus spp.) are trees and shrubs unrelated to chestnuts and can be toxic if not prepared properly," Wahle warns. "There are many similarities between chestnuts and horse-chestnuts and only an experienced and informed forager should collect nuts from the wild for consumption. The water chestnut (Eleocharis dulcis) is not a nut at all, but the corm, or belowground stem, of a grass-like sedge that is grown as a vegetable in aquatic habitats." Chestnuts are a highly perishable, high-starch, low-fat food unlike other common tree nuts. For this reason, chestnuts should be purchased close to the time of intended use. "Choose chestnuts with clean outer shells that are a shiny brown color," Wahle says. "The tan-colored end of the nuts should be free of mold. The freshest chestnuts are very firm and do not dent when pressed. When cut, the kernel should be yellow. Avoid chestnuts with blue streaking through the kernel, a vinegary smell, or a slimy feel. Chestnuts lose moisture quickly at room temperature and humidity, causing the kernels to dry, harden, and become moldy. To extend the storage life, maintain proper moisture conditions by storing chestnuts in a ventilated plastic bag in the refrigerator and use within a few weeks. "Because of the high moisture content of the kernel, the outer shell and pellicle must be pierced with a sharp serrated knife, regardless of cooking method. Avoid cutting into the kernel to make shelling easier. A single slit across the widest part of the nut is sufficient to prevent bursting during the cooking process," Wahle notes. Chestnuts may be roasted over an open fire for 15-20 minutes with constant motion; roasted in a conventional oven at 300-325°F for 15-20 minutes; boiled or steamed for 10-15 minutes; or microwaved wrapped in damp paper towels for 45-50 seconds on high. "Regardless of the heating process, peeling is easier if nuts are allowed to cool just enough to handle without injury. As nuts cool, peeling the pellicle from the kernel becomes an ever-increasing challenge," Wahle says. Chestnuts are not crunchy even when roasted; their texture comes closer to a hard cheese. Although roasted chestnuts can be eaten by the handful, chestnuts can be utilized in a number of culinary endeavors, including flour, thickening for soups, poultry stuffing, nut breads, cakes, puddings, and even wine. "I hope more Americans get to know chestnuts this holiday season," Wahle says.